I’m longing for spring to come and stay. In late February, it seemed hopeless, so I planted a pot of microgreens. The seed packet promised they would be ready to eat in 2 weeks. The seeds germinated within the first week, and I moved the pot to the sunniest window, in the bedroom. After two weeks, the greens were growing, but looked too pathetic to eat. Each seedling still had only two leaves, about an inch long. I just let them keep growing. I was good about raising the shade in the morning for sunshine, watering so the greens would keep growing, and rotating the pot so the leaves would grow straight. It’s been about six weeks, and the salad was starting to look edible. Tonight, I harvested it all. We had a very mini-salad of microgreens. It wasn’t much more than a taste, but it was very exciting and very satisfying to eat my own greens in early April, from my indoor, bedroom, garden! The timing was right. The weather is finally starting to improve. Last week’s snow has melted. The temperature is staying above freezing (though not by much). My morning boot camp started outside this week, three weeks earlier than in past years. It was actually pleasant. This weekend, I plan to spray paint and hang a planter on the back of the garage for lettuce and radishes. We’re having a bunny issue, so this will help keep my spring greens out of their reach. I’m expecting to have greens from my own outside garden some time in May. I think it might be spring. 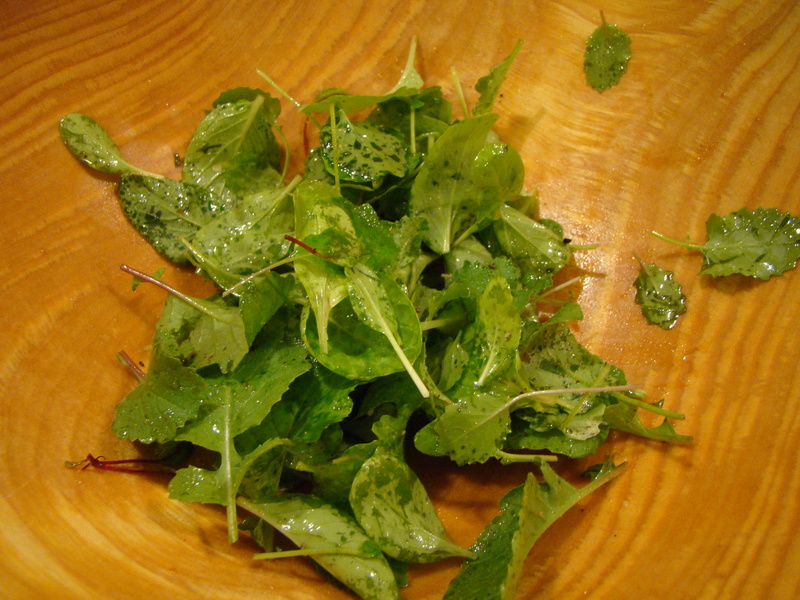 Use the amount of mesclun greens you want to eat. Wash the leaves and dry them very well. I use a salad spinner. Pour a tablespoon or two of the best extra virgin olive oil you have into a wooden salad bowl that’s much larger than you think it should be. You need plenty of room for tossing. Add the greens and toss very well. Each leaf should be lightly coated in oil. Add more oil if there’s not enough. Squeeze a little fresh lemon juice over the salad, along with a shake or two of Worcestershire sauce and a generous seasoning with kosher salt and freshly ground black pepper. Taste and adjust the seasonings to your liking. 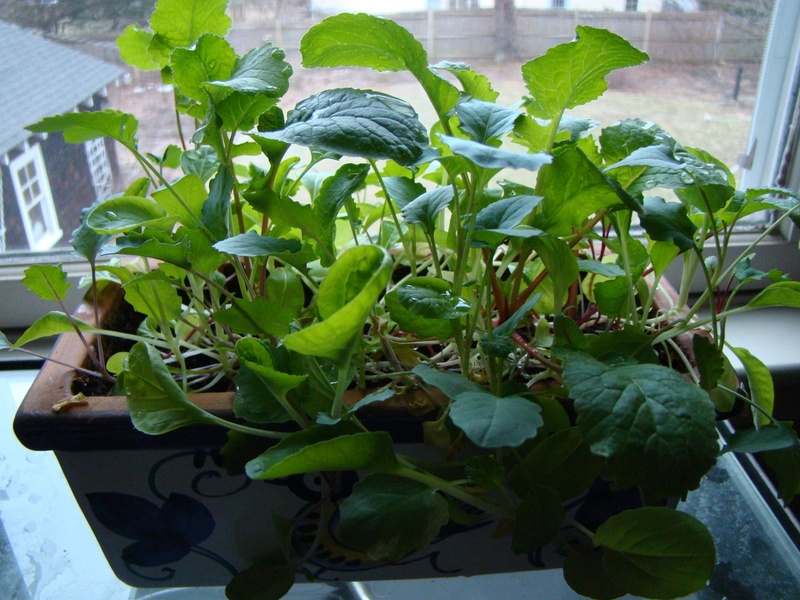 Posted on 6 April 2011, in General and tagged indoor gardening, salad. Bookmark the permalink. 5 Comments. There is nothing more satisfying than harvesting and eating food that you have grown yourself. How very exciting! It looks so good and I bet was delicious. That’s a great idea to use Worcestershire sauce in the dressing. Talk about eating local! That’s as good as it gets. Can we talk E.V.O.O. sometime? I’d love to find a reliable bottle. Isn’t it amazing how satisfying it is to make your own than buy it ready made? I am very impressed with your crop!